John Nunez received his Bachelor’s Degree in physical education at Minnesota State University, Mankato (formerly Mankato State University). 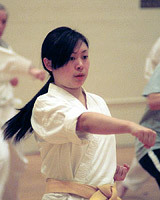 While there he was able to train and teach karate as well. He later received his Master’s Degree in Education Leadership in Belize and currently is completing a doctoral program in Education with a focus on Social Justice at the University of Massachusetts, in Amherst (USA). 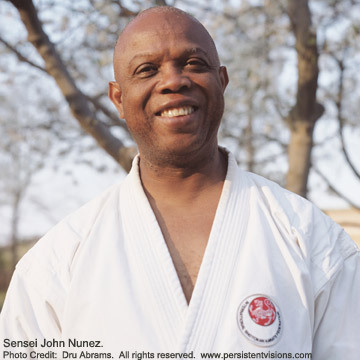 For the past 24 years, Nunez has received most of his training at ISKF Headquarters in Philadelphia, Pennsylvania under Teruyuki Okazaki, who is a 10th degree black belt and head of the ISKF. The sessions were “fierce and intense” as expected”, he said. “One thing that keeps resonating in my mind from Okazaki Sensei is training to be the best person I can be—not only physically but spiritually as well; building character,” he said about his training. Click here to read the original full article written by Christina Fong, Journalism Major at the University of Massachusetts and 6th kyu Karate student of John Nunez.